This soup is perfect for cold winter nights. Roasting the cauliflower and garlic sweetens the vegetables. You get a bit of heat from New Mexican red chile powder and spices. Creamy coconut milk balances everything out. Be sure to serve with delicious bread or rolls to dip in the bowls of soup. I plan to serve this soup as part of Christmas Day dinner this year. I think it will be wonderful served alongside Prime Rib, Honey-Glazed Roasted Carrots with Cayenne Pepper , Spiced Winter Squash Muffins, green salad with a cheese plate and assorted cookies for dessert. Merry Christmas Everyone! Preheat oven to 425 degrees. Prepare the cauliflower by first washing and removing leaves. (Chop leaves and save for later in the recipe). Cut off the stem and then cut cauliflower in half lengthwise and then again into quarters. Place one of the cut sides down on a cutting board and...with the knife at an angle...cut off stem. Repeat with remaining three pieces. Break cauliflower into bite sized florets. Chop half of florets into small pieces. Place prepared cauliflower florets (not chopped ones) on a rimmed parchment lined baking sheet. Run 4 passes of olive oil bottle over pan and, using your hands, roll cauliflower in oil ensuring everything is evenly coated. Place in preheated oven for 20 minutes. Remove from oven and add garlic and another 2 passes of e.v.o.o. stir and sprinkle large pinch each salt and peppers over vegetables. Return to pan and roast for another 10 minutes. Keep roasting until the cauliflower is beginning to brown and caramelize. Remove from oven. Add 2 tbsp olive oil to a large pot and gently heat. Add onion, jalapeno and reserved cauliflower greens and cook over medium heat until vegetables are soft. ( about 6 minutes). Add chile powder and cayenne pepper, stir and cook for an additional minute. Add potato, chopped cauliflower and 1 quart of vegetable stock. Increase heat to high, bring to a boil, reduce heat back to medium and simmer for 25 minutes. (Vegetables should be very soft. If not continue simmering for an additional 5-10 minutes.). Add in the roasted cauliflower, stir and heat for an additional minute. Using a stick blender***, puree the soup until well mixed and fairly smooth. (Note, this soup has texture from the potato peel and greens which I like. If you want a very smooth soup, pass through a strainer or food mill). Add the coconut milk, small pinch of salt and one of pepper and cook over low heat for 5 minutes. Add additional vegetable broth if too thick. Taste and adjust seasonings if needed. Serve in large bowls, each drizzled with a bit of olive oil, a pinch more of the red chile powder and a sprinkling of cilantro. *** If you don't have a stick blender you can use a regular blender. Do this in two batches and be very careful...soup is HOT. It is " Holiday Side Dish" week at Food Network's Fall Fest roundup. Check out the other delicious sounding recipes from my blogger friends. Do you have a favorite side dish recipe? Please share in the comments section and/or link to your blog if you have one. 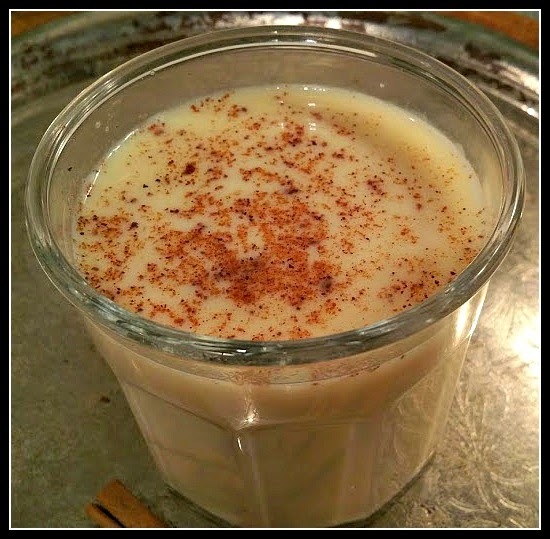 I love this version of eggnog. Can I still call it eggnog if there are no eggs in the recipe? Traditional versions of this wonderful holiday drink are, of course, delicious, but they just don't sit well with me. Too rich, too much dairy. I combined almond milk and coconut milk and added some coconut oil for richness. The spices scream "the holidays are here!" and the tiny bit of turmeric adds a bit of color to resemble the real thing. I used maple syrup to sweeten to stay away from sugar, but honey, organic sugar or a healthy sugar substitute can also be used. 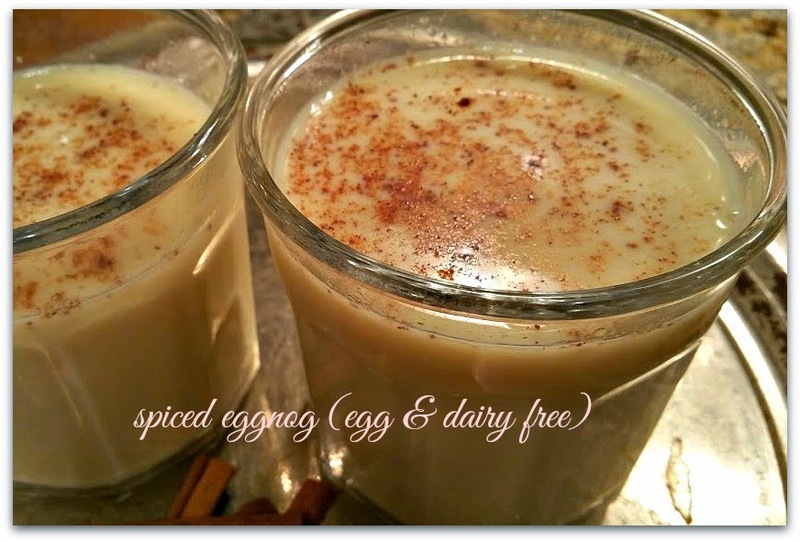 And, to me, it wouldn't be eggnog without the rum...but this is totally your call. Enjoy! Add almond milk, coconut milk, coconut oil, cinnamon stick, whole nutmeg, sea salt and turmeric to saucepan, Heat until small bubbles begin to form...do not let boil. When hot, whisk in vanilla, 1/2 teaspoon nutmeg and maple syrup to taste. Remove nutmeg and cinnamon stick. Pour into mugs and add the amount of rum you want...usually 1-2 tablespoons. Dust top with grated nutmeg and serve. It is " Holiday Cocktails" week at Food Network's Fall Fest roundup. Check out the other delicious sounding recipes from my blogger friends. Do you have a favorite cocktail recipe? Please share in the comments section and/or link to your blog if you have one. It is the first week of December and my holiday baking has begun. 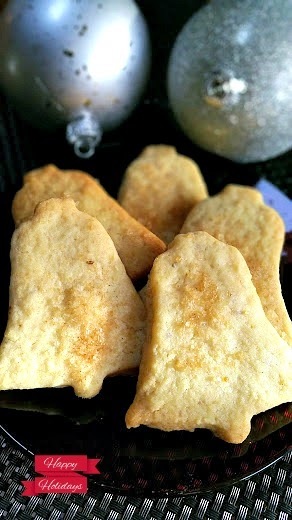 This year I am making batches and batches of Biscochitos, the delicious anise seed flavored, shortbread-like cookie made famous in New Mexico. So famous that in 1989, the New Mexico state legislature made them the New Mexico State Cookie! 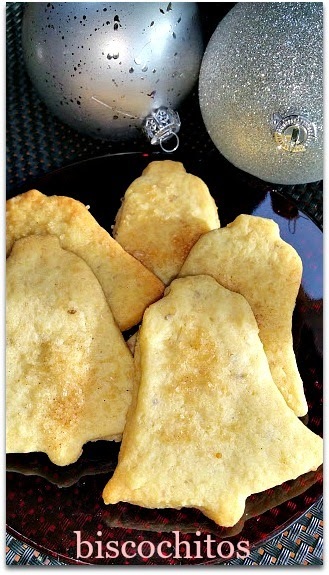 There are many versions on the basic Biscochitos recipe..all containing a lot of lard or butter, flour, sugar, anise seeds and brandy or rum. Purists insist that only lard is acceptable...they claim the flakiness lard provides is unmatched by anything else. I made mine with butter to ensure the vegetarians in the family can partake, but you can use whatever you like best. 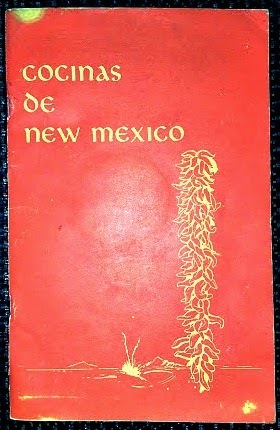 My friend Pamela gave me an old cookbook Cocinas de New Mexico which while undated, looks to have been published in the 50's or 60's. 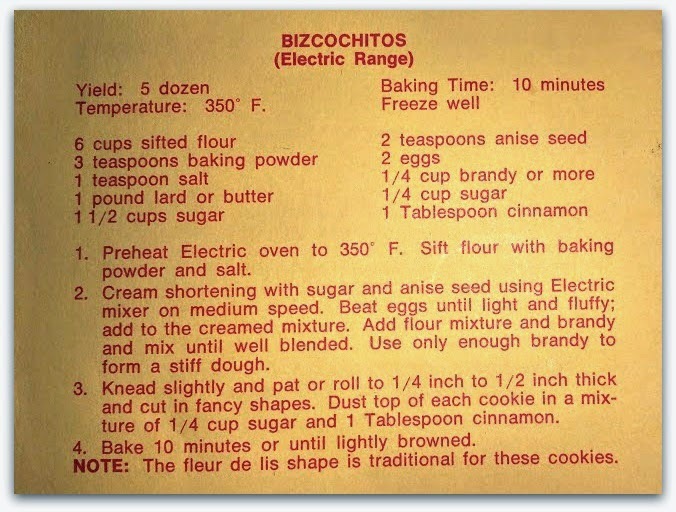 The book includes a recipe for Biscochitos (although they are spelled Bizchochitos) and that is the recipe I used today. I used the exact ingredients called for but adapted the technique a bit. I am posting the recipe straight from the cookbook with my changes listed. I love that the instructions are for an electric range. I used my gas oven. I added the flour mixture one cup at a time and added the brandy after 3 cups were added. I needed the full 1/4 cup of brandy. It is " Holiday Cookies" week at Food Network's Fall Fest roundup. Check out the other delicious sounding recipes from my blogger friends. Do you have a favorite cookie recipe? Please share in the comments section and/or link to your blog if you have one.